Plant ID class this August!Treephilly Plant ID class this August! Plant ID class this August! 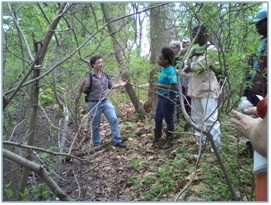 Come learn how to identify plants and do a vegetation survey with Dr. David Hewitt in Cobbs Creek Park this August! Classes are free and open to the public, and are part of Philadelphia Parks & Recreation’s Citizens Participating in Research and Restoration (CPRR) program. Classes take place at various times in Haddington Woods (meet at the Bocce Court parking lot at Daggett and Vine St. 19139) on Sun. 8/9 and Mon 8/10. More information can be found here. New dates have been added to this class series! Three classes are available on September 21 and 22. More information about the September classes can be found here.